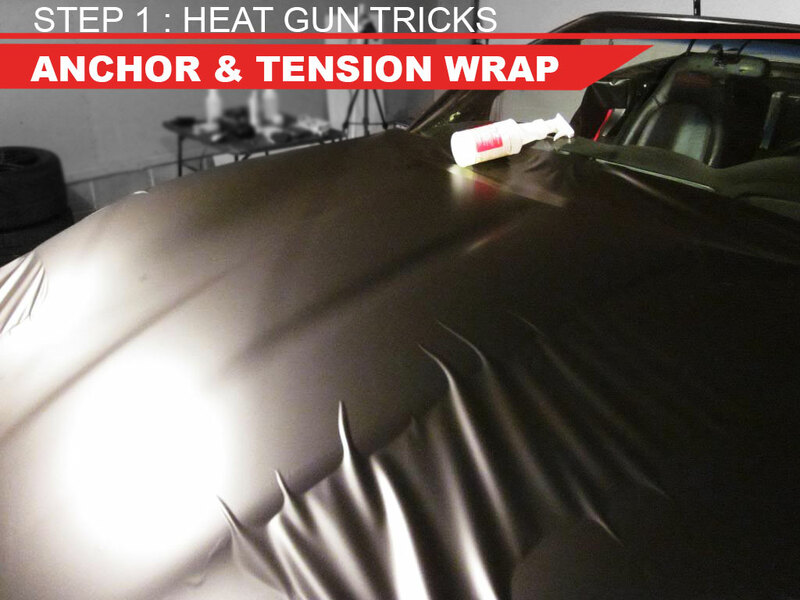 The heat gun: as much as DIY installers hate to admit it is the one vinyl wrap tool you just can't live without. As we mentioned in our post on cold pre-stretching, vinyl films have a memory which is both a curse and a blessing. Most importantly of course though is the fact that this memory can only be triggered through the use of a heat gun. 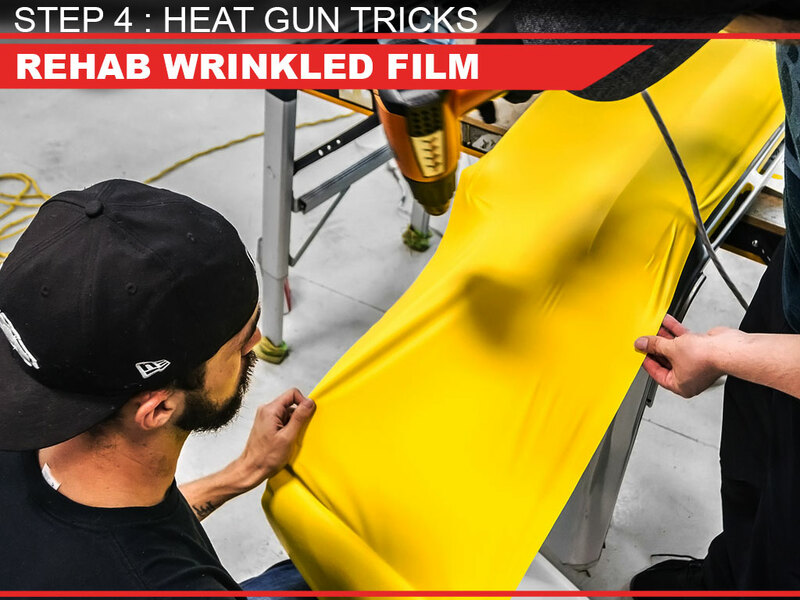 Today we'll cover four different heat shrinking techniques that anyone can perform with a heat gun and that will take your wrapping expertise into the big leagues and give you pro-grade results. When you're wrapping a large area of a vehicle you want to anchor the film to about four points (depending on the application and assuming that your wrap is rectangular). As you do this, you want to tension the film trying to make it as smooth and as taught as possible. When you've got the film in position as tight as you can you will notice some larger ripples or wrinkles in the vinyl. This is completely normal. Spend a couple of minutes going around and actually adjusting it trying to remove as many of these wrinkles and ripples as you can out of the film. At this point, once the film has been tensioned and smoothed as much as possible, it's time to use some heat on those remaining wrinkles to activate the vinyl's memory. In essence, vinyl wrap films behave exactly like shrink-wrap when heated. Of course, it take a little practice to know how much heat to use and how much you can stretch a given film but with some time and patience you'll be a pro in no time. 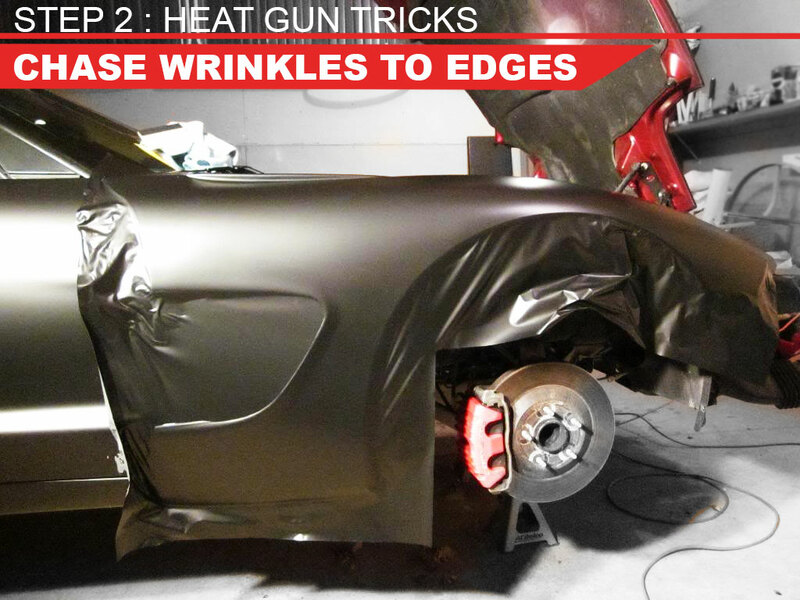 Naturally, there are some parts of the wrap where the heat gun technique won't work. There's only a certain amount that the film will actually shrink so you'll find that there are some parts where there's a curvature in the panels that results in an excess amount of intentioned film so it can't shrink. Typically those areas are near the edge of the panels anyway so they can be dealt with later using another technique. At this point, it's really now just a matter of using your squeegee and basically just pushing the film straight onto the surface of the smoother areas you've already shrunk. 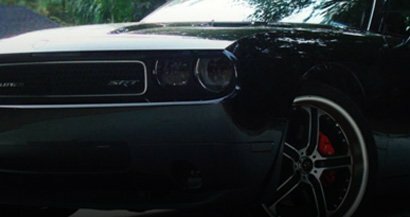 Certain areas of every vehicle cause special issues. Some prime examples of this are badges, door handles and gas caps which can create areas of highly localized tension which results in tight, small ripples. In order to prevent these from becoming larger wrinkles and eventually much dreaded creases, it's best to remove them early on. How to do it? Since today's post is all about heat gun techniques, of course you need to use your heat gun. Apply heat along with a squeegee or application card to smooth out and push in the sharp ripples. 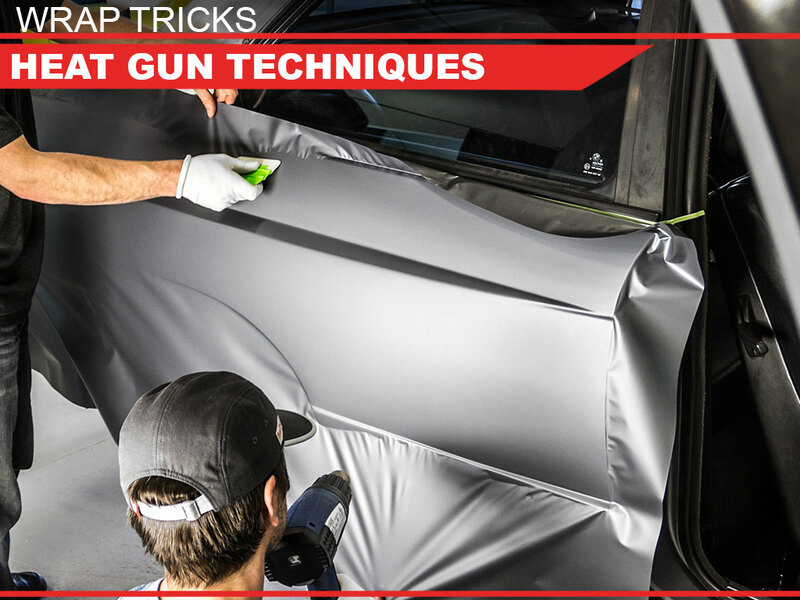 In another post we'll get into how to approach door handle and gas cap wraps but for the time being this is all you need to know to wrap the larger areas of your car, truck ort SUV. Once you've worked out all of the major wrinkles and tiny ripples using the techniques above, there's a good chance you'll have some pretty gnarly and wrinkled vinyl at the edges. Here too, your heat gun will save the day and help you salvage the film. Simply hold the vinyl taught and use the same technique to release and shrink the vinyl wrap back into its smooth shape. Easy as pie. 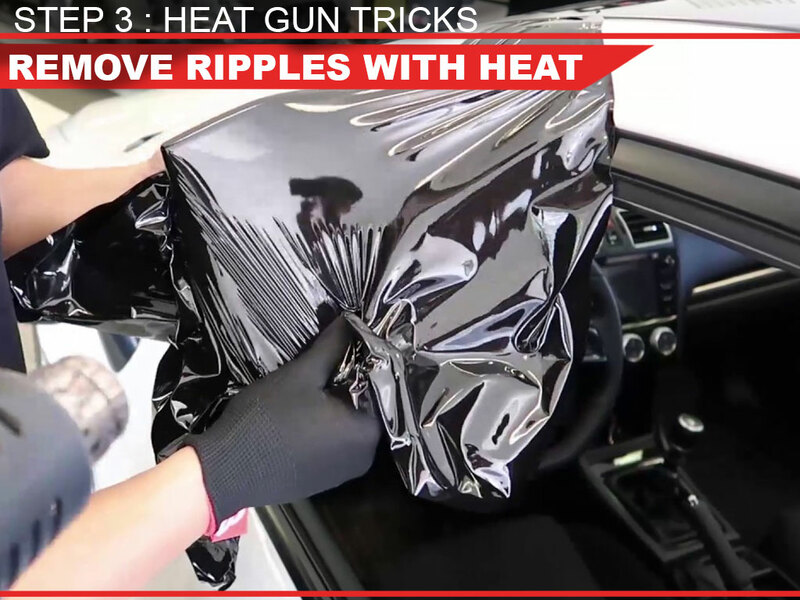 Obviously, seeing these things done is much easier than reading about them, so we've included two videos below from 3M™ that show how to work with a heat gun and which cover all of the tips above. We're constantly adding new installations of our Wrap Tricks series so be sure to check back soon.